The HotRod Hotel is made up of a team of professional friends: Dale, Bruce and the Hotel Gang. Our Hotel is trying to bridge the gap between people’s passions and a place to make that happen. We can add to your ideas, show you how to achieve them and help you along the way. Don’t have a place for your ‘fun’ car at home? Store it with us and enjoy it whenever you like! 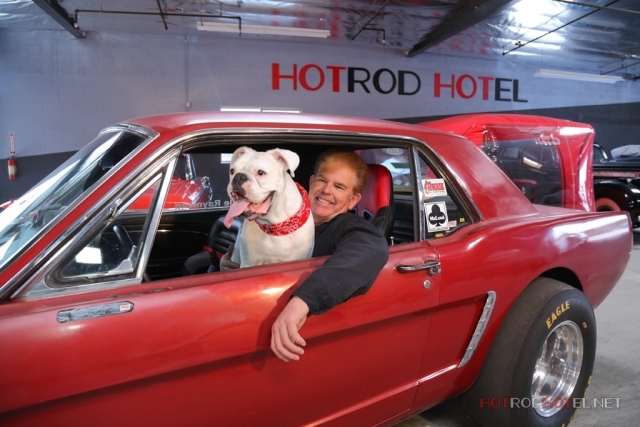 Dale Raymond is the owner/creator of the HotRod Hotel. Dale spent 40 years as an Operating Engineer, operating, maintaining and repairing many types of Heavy Construction Equipment. As an Equipment Superintendent he had hundreds of units and people the he cared for daily. While equipment was his life by day, he was participating in races, Hotrod fabrication and the Classic Muscle Car lifestyle at night and on weekends. It has been his ambition to have a place where people and friends could gather to enjoy their cars and all that the lifestyle has to offer! Hotrods, Customs, Classics, Antiques, Collectables and the lifestyle that surrounds them is what makes us happy! If you love cars and the car scene like us, then this is the place for you. Bruce is our “Go-to” guy. Bruce Keough has had a distinguished career as a Registered Ford Tech, Service Writer and Service Manager. He is especially good with brakes, suspension and steering. His diagnostic talents are unsurpassed! Whatever the problem with your car, Bruce can get to the bottom of it and provide the correct option(s) for you. Ed’s ideas have had a lot to do with making The Hotrod Hotel a success. Early on, Ed had a vision of what the Hotel should be like. He has played a very large part in our concept, the look and the feel of our Hotel from the very beginning. He also handles the equipment operation/logistics for HOTROD HOTEL LLC. Ed takes care of us all here…our day-to-day operations depend on his maintenance expertise and knowledge. When the boss is onsite…watch out! With a very heavy heart, we must say that our lifelong friend ED has passed away. He will be sorely missed at the Hotel. HotRod Hotel is located within minutes of Huntington Beach, Sunset Beach, Seal Beach, Westminister, Long Beach, Fountain Valley, Newport Beach, Santa Ana, Irvine, Garden Grove, Los Alamitos, Cypress, Anahiem, Orange, Tustin, Cerritos, and Lakewood.